Synthetic peptide corresponding to Erk1 (pT202/pY204) + Erk2 (pT185/pY187) conjugated to Keyhole Limpet Haemocyanin (KLH). 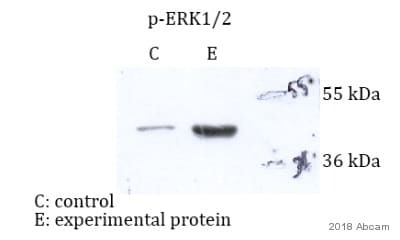 Synthetic peptide corresponds to the phosphorylated form of human ERK1 and ERK2 activation loop. The epitope recognized by ab50011 is located in the region of phosphorylated threonine and tyrosine residues within the regulatory site of active MAP kinase (Thr185 and Tyr187 in ERK-2). 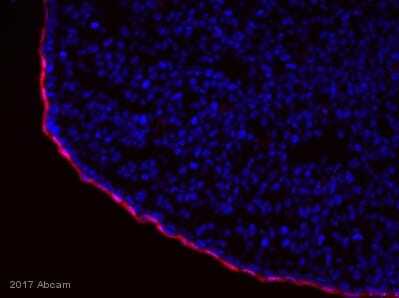 Rat brain extract, Drosophila wing imaginal disc. This product was changed from ascites to tissue culture supernatant on 25th October 2016. The following lot is from ascites and is still in stock as of 25th October 2016- GR185138. Lot numbers higher than GR185138 will be from tissue culture supernatant. Please note that the dilutions may need to be adjusted accordingly. Our Abpromise guarantee covers the use of ab50011 in the following tested applications. WB 1/10000. Predicted molecular weight: 44 kDa. 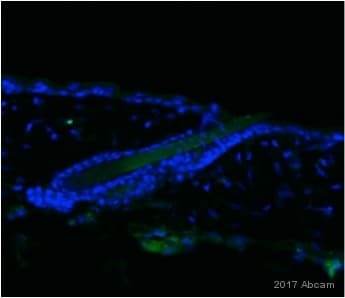 In situ immunostaining of the activated form of MAP kinase with ab50011 (green) in Drosophila wing imaginal disc (500 micrometers long). ICC/IF of NRK cells labeling the activated form of MAP kinase with ab50011 (1/1000 dilution). 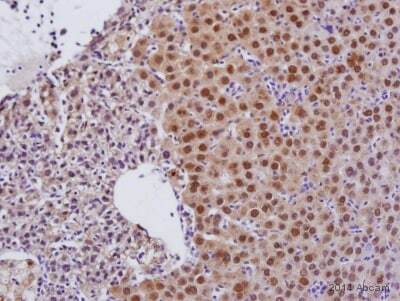 The antibody was developed using Goat Anti-Mouse IgG, Cy3™ conjugate. 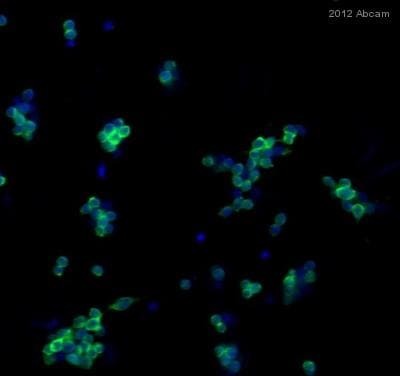 Cells were counterstained with DAPI (blue). Publishing research using ab50011? Please let us know so that we can cite the reference in this datasheet.